Television shows have kind of gotten away from the "Holiday episode" that used to adorn every season of ever hit TV show. Now Modern Family tries to keep it to every other year, and other shows decide to ignore it entirely. Sure, it's still around but television used to completely revolve around the holiday in the December months. It's no longer a gimmick and is treated as just another event in the character's lives. Well thank god for the 80's, 90's, 00's -- really, any time that's not now -- because we got more than our fair share of Christmas specials. These would often be so plastered in Christmas jubilee, that the entire story would follow some classic yuletide paradigm (the most popular being Scrooge). But that didn't matter because TV was meant to be an escape. 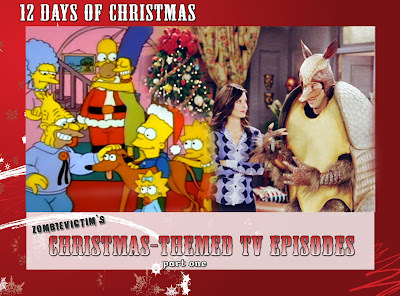 So here's a collection of all my favorite Christmas episodes for you to whet your whistle on (I even provided a link with how to watch them). Those that see South Park as just a raunchy cartoon with potty humor really must not be watching the episodes because the great aspect of the show lies in the storytelling. Just look at this Season 8 Christmas episode that progressively builds on itself, leading to a thrilling conclusion. It's one of the more fantastical episodes, yet it's also one of the more rounded of the series. Ongoing in-jokes (Cartman's undying hatred for Kyle and his jewness) and pure insanity (the critter's are satanic cult members) make this a Christmas episode unlike any other. It's hard not to laugh seeing Ross in a giant Armadillo costume, trying to explain the point of Hannakah to his son, only to be interrupted by Santa and Super-man (Chandler and Joey). That scene alone is enough to make the episode worth it. But it also makes a good point about the holidays and to show respect to the things happening at the same time as Christmas. It's done in that ridiculously obvious sitcom fashion, but it's a good thought nonetheless. I received the first season of The Simpsons on DVD and proceeded to watch the first episode and it's one that I've watched nearly every Christmas since. At the time, The Simpsons was my absolute favorite TV show. The current product was less than stellar, but those fantastic years of the 90's were relatively recent and had a great part in developing my own sense of humor. I owe a lot of what I like today to The Simpsons. And it really amazes me just how strong the show starts off. Sure, the animation is a little rough but that just adds to the nostalgia -- which I, of course, love. And dammit if it's not absolutely hilarious. This is still back when the show treated its world in a more realistic light, and so the situation never gets too out of hand. And ultimately, "the feels" come in full force, as a strong message of family resounds. An "It's Always Sunny" Christmas episode brings with it everything you would expect: The Gang taking normal Christmas traditions and making them completely useless. Decorations to get everyone in the Christmas spirit? Better do that the night before Christmas. Or how about throwing rocks at trains to really lay in the point? Sounds like the perfect night for Charlie and Mac. And, in classic Christmas episode fashion, there's another instance of the "Scrooge" storyline coming into play, with Dennis and Dee trying to show Frank the error of his ways. He even goes "Rankin Bass" animated for a scene. If there's anything we really need in this world, it's another Sunny Christmas episode. Please? Any episodes I may have missed? Well be sure to check back for Part 2!